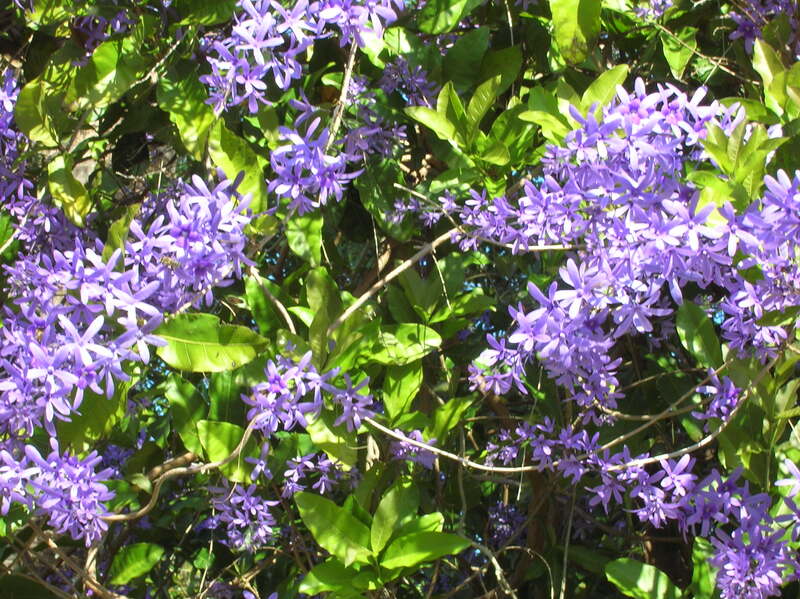 Queen’s wreath (Petrea volubilis) in full bloom in late-February in Port Salerno, Florida, is a sight to see and a honey-bee magnet. 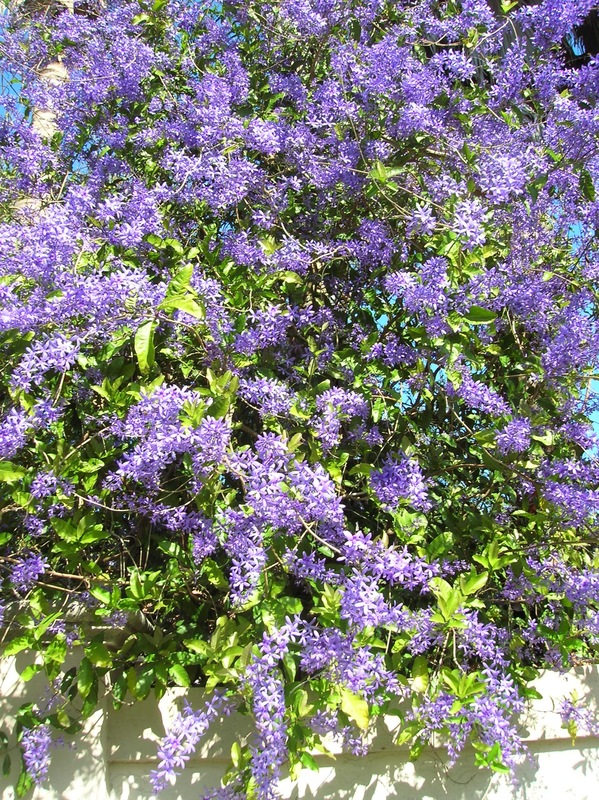 This huge flowering vine is covered with bees ‘a’buzzin, and its glorious color makes it a real traffic-stopper. 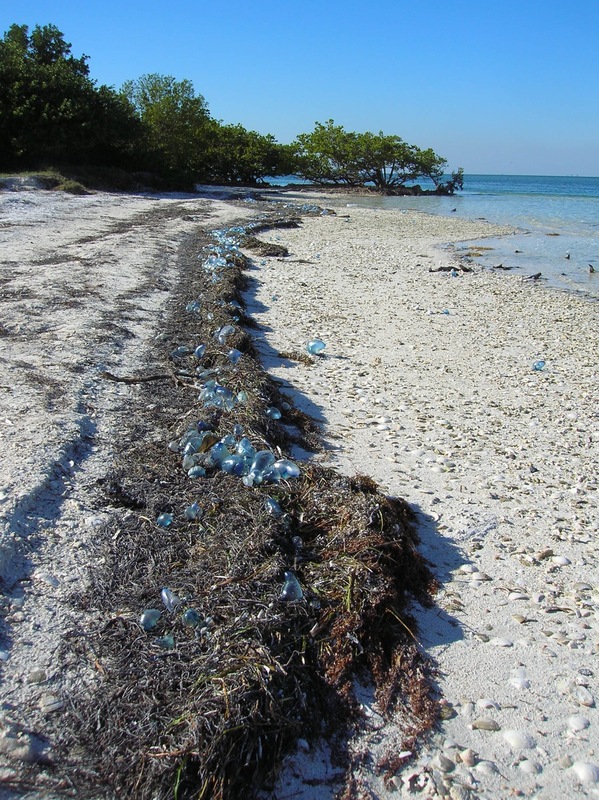 Sea lavender (Mallotonia gnaphalodes), or beach heliotrope or bay lavender thrives on the beaches of Boca Chita, a tiny cay at the top of the Florida Keys. 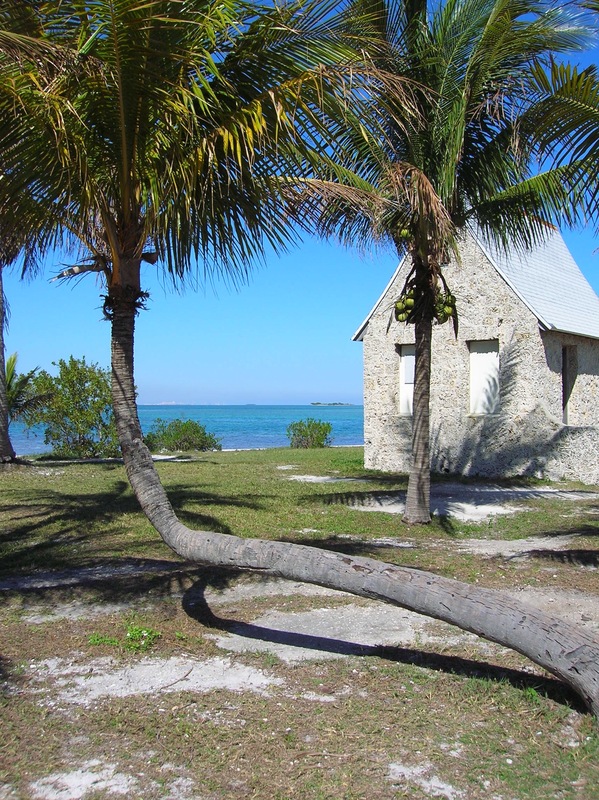 This little island, along with neighboring Elliott Cay are part of the Biscayne Bay National Park, and are only accessible by private boat. 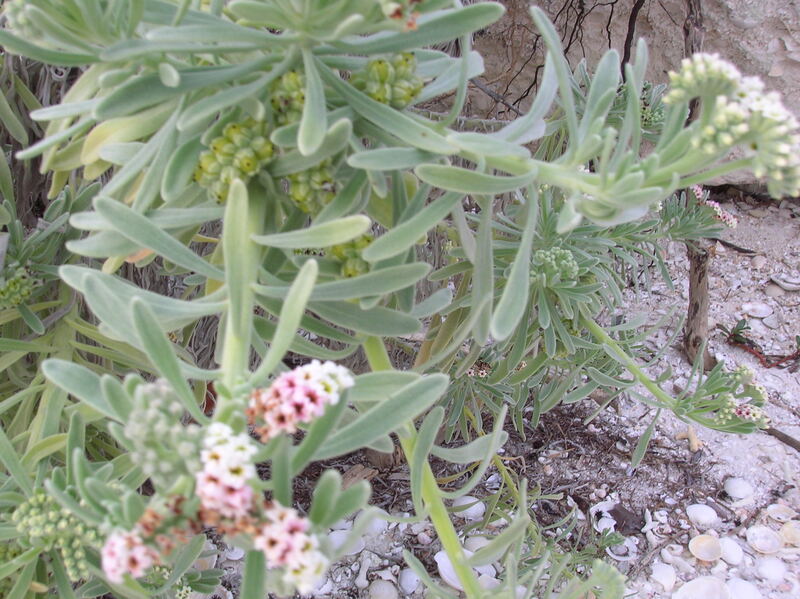 For the sea lavender that seclusion and protection has been its salvation, because this once-common seaside plant has become very rare with coastal development and habitat destruction. 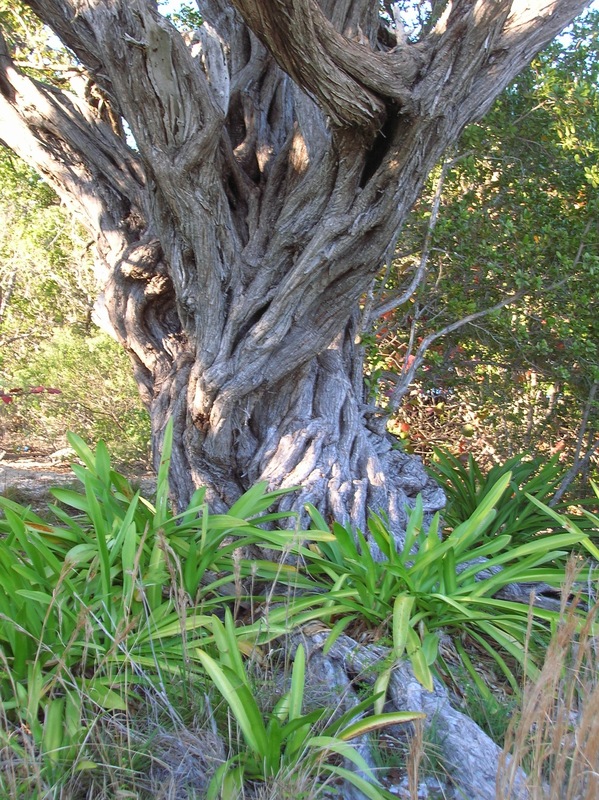 The once-private island is a haven for all manner of native trees, shrubs, grasses and wildflowers. Two, huge and gnarly old buttonwood trees command attention at the center of the low island. Rustic coral buildings, a stately “lighthouse,” and other structures can still be found from the days when the islands belonged to a wealthy industrialist. 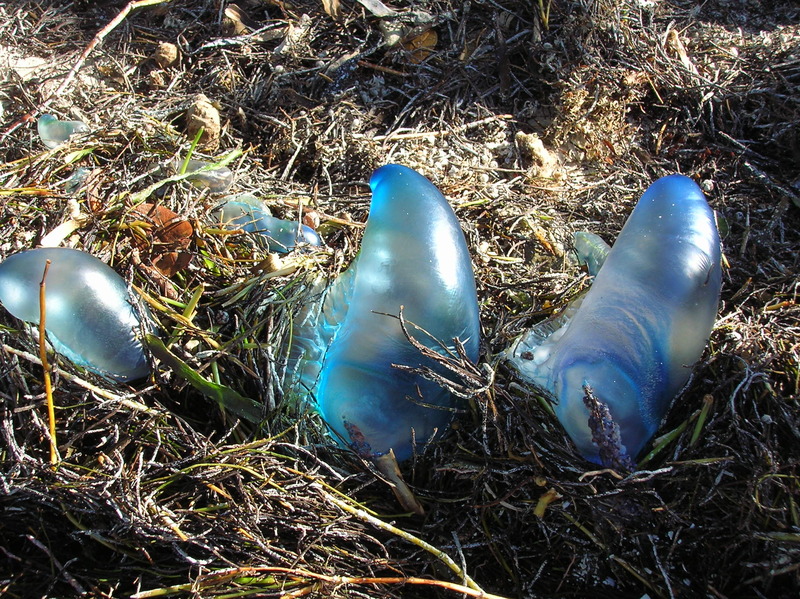 In mid-February the beaches also were covered with hundreds of brilliant blue Portuguese man-o-war that make swimming a risky choice. Long, stinging tentacles are strewn out beyond the inflated blue “sails” of the creatures. Also on the beaches are small, brilliant purple-blue snails that sport inflated sacs though clear ones of their own. The snails prey on the man-o-war. Go snails! 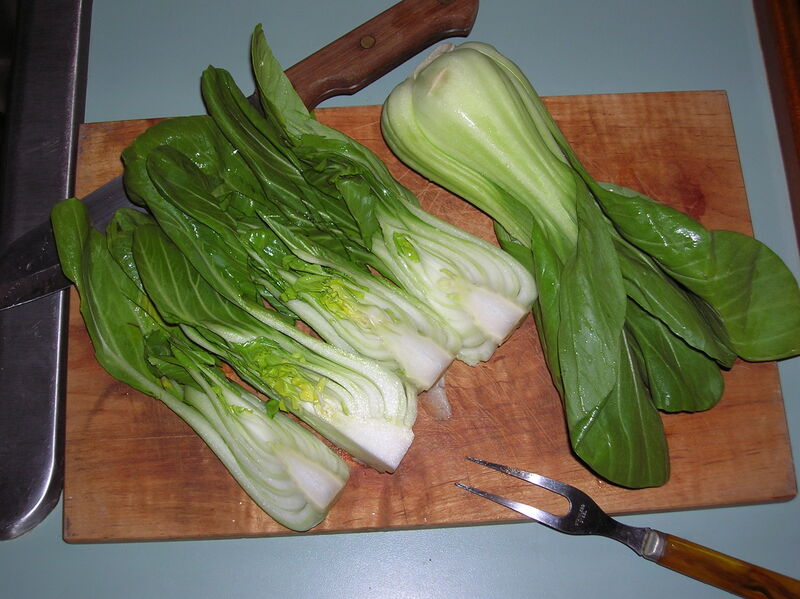 Baby pak choi, oh yeah! Crispy, sweet, vase-shaped 6 by 8 inch mini-heads with pale lime green crunchy stalks and dark green leaves. Compact, fast growing and delicious braised, steamed, or stirfried. (I like to add a splash of balsamic vinegar at the very end when cooking it, to liven things up). Plant this one early for best results as it handles cold weather better than hot. Plus flea beetles will be a problem as the weather heats up. Delicious! The stalwart Conch Republic chickens that freely roam the streets of Key West are both adored and reviled by local residents. Over the years there have been campaigns to rid the city of the birds, especially when the avian flu or other bird-transmitted epidemics threatened. But eventually calmer heads and the birds themselves prevailed. 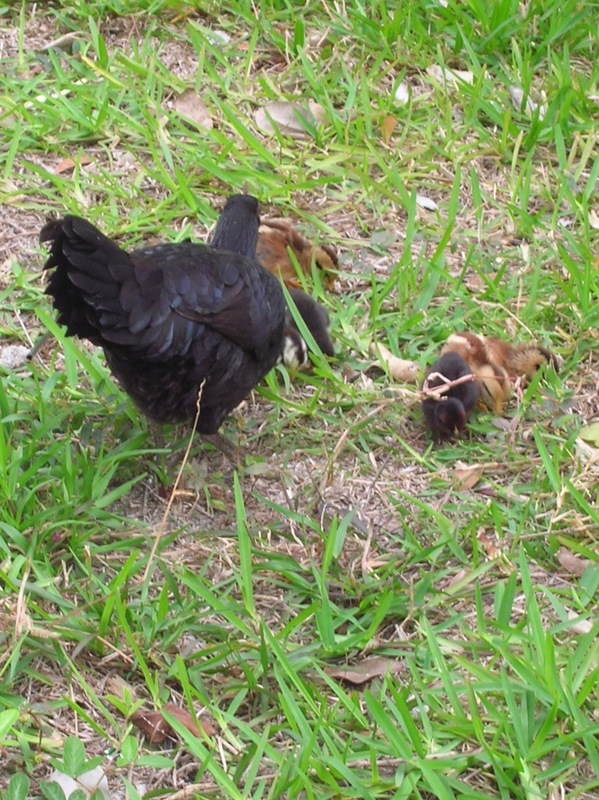 Today the Key West “gypsy” chickens pretty much have the run of the island. Reports say there have been free-roaming chickens in Key West for some 175 years, probably originally brought to the island by early Cuban settlers. In some ways the feral chickens seem to provide one valuable service, cleaning up bits and pieces of food that find their way to the streets and gutters of the busy town. No doubt the chickens also consume their fair share of bugs and weed seeds as well. But more importantly the touch of “character” they add has to be immeasurable. Tourists just love the birds. Recently while strolling the calmer side streets of the old town with its lovely old Conch homes, we encountered several clutches of newly-hatched fuzzy chicks alongside their mother hens. Each time we noticed a rooster nearby as well, a bit surprised that they seemed to form a tight family bond. We later came to understand just how tight those bonds are for the Key West chickens, as we witnessed a life and death “chicken drama” that probably occurs much more often than most visitors to the colorful town would realize. As we waited at one of the bus stops we enjoyed the sight of a mother hen with nine fuzzy little chicks. Again, nearby was a rooster as well. Tourists stopped to snap pictures and watch the little family. The mother hen didn’t seem to mind at all as she and her chicks busily pecked the ground for food. In a moment we realized why she seemed to find comfort in their presence as a large hawk swooped down upon the chicks. Before the diving hawk could get close the hen flew up five or six feet into the air in a noisy fury to rebuff the attack. When the hawk retreated to a nearby palm tree to rethink its strategy, the rooster came in closer. Over and over again the hawk dove on the family of chickens, even as amazed tourists stood close by. No hawk we’ve ever encountered would have made a strike in such proximity to humans. Town chickens and town hawk. All those birds were obviously used to lots of human company. We can’t report on the eventual outcome as we purposely moved to another bus stop down the street, indeed to avoid witnessing what was likely to come. As we left, the hawk could be seen waiting patiently for its next opportunity to strike. Perhaps the hen and rooster prevailed this day, we cannot say for sure. 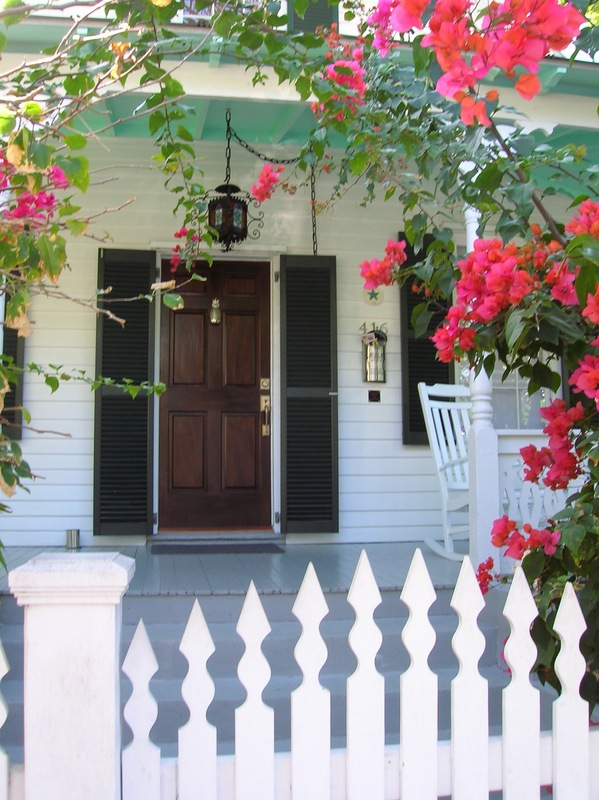 But one thing was for certain, this type drama no doubt plays out frequently on the streets of Key West as all players seemed quite accustomed to their parts that day.